Editor's Note: Music by Prudence, which eanred the Academy Award for Best Documentary Short Subject, airs May 12 on HBO. Here's an interview we conducted with director Roger Ross Williams in the days leading up to the Oscar telecast on March 7.
inspirations, the challenges and obstacles, the goals and objectives, the reactions to their films so far, and the impact of an Academy Award nomination. So, to continue this series of conversations, here is Roger Ross Williams, director/producer of Music by Prudence, which is nominated in the Documentary Short Subject category. Synopsis: Prudence lives in Zimbabwe, and for a long time almost no one knew about that hauntingly beautiful voice. No one knew the strong, resilient woman that owned it. They were unable to overlook her body: crippled and deformed with a debilitating condition called arthrogryposis. When Prudence was born, her paternal grandmother wanted her dead. 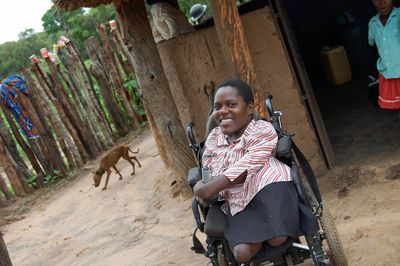 In Zimbabwe, disabled children are believed to be the result of witchcraft. In extreme cases, families kill them--to remove the "curse" from their family. Prudence's mother kept her and fed her. Cast out of her husband's (Prudence's father's) home, she brought the baby to her own mother's rural home. Four years later, she left. Prudence was raised by her maternal grandmother, Rachel, who taught her to sing. But when Prudence turned 7, Rachel knew she couldn't school her, so she sent her to live with her father and his new family. There, Prudence fell prey to neglect and isolation, in an unloving and unsupportive environment. Physical Disabilities (KG6), which offered her a scholarship, and her new life as a singer/songwriter began--first as a student, and now as a teacher. Music by Prudence traces the path of this young woman, and her remarkable transcendence from a world of hatred and superstition into one of music, love and possibility. Roger Ross Williams: As a child I was never very popular, and I lived in my own fantasy world. I escaped by writing short stories, which eventually evolved into documenting other people's stories as a television producer/director for Sundance Channel, Discovery Channel and PBS. But I've always wanted a bigger canvas, and independent documentary film has provided that. IDA: What inspired you to make Music by Prudence? resilient spirit, her determination to survive and overcome obstacles, and her message of hope inspired me. RRW: Everything was a challenge in making this film: Shooting in a country with the highest rate of inflation in the world, with sporadic electricity, water and basic resources--all with the backdrop of a violent political election. I can't tell you the details, but it's a miracle this movie ever got made. RRW: As the film developed, so did the focus of the story. While I had originally set out to include other members of Prudence's band as main characters, as all filmmakers know, the story you set out to shoot isn't always the story you end up with. Prudence's story shone through in a way that was illuminating and enlightening. IDA: As you've screened Music by Prudence--whether on the festival circuit, or in screening rooms, or in living rooms--how have audiences reacted to the film? What has been most surprising or unexpected about their reactions? RRW: Audiences have been blown away. Some of the words I get are "blown away," "inspired" and "entertained." I was most surprised by the intensity of the reaction to her story. I think the intense reaction is partly because seeing this powerful woman living her life so proudly and fully with a severe disability in a country that has experienced such profound economic devastation allows audience members to reflect deeply on the blessings in their own lives, and awakens the passions of their own possibly dormant dreams. RRW: I got together with a bunch of friends on the morning of the announcements. My first reaction was to call Prudence in Zimbabwe to tell her she was coming to the Oscars. For someone like Prudence, who has had such a challenging life, to finally be recognized for her talent and her beauty, and to roll down the red carpet is beyond amazing to me. RRW: Albert Maysles, because Salesman is one of my all-time favorite films, and he's a genius. Barbara Kopple, because she has such deep empathy for her subjects, takes real risks and she's brilliant. And any documentarian who takes risks and pushes the boundaries of the genre to new heights. Music by Prudence will be screening Saturday, March 6, at 9:00 a.m. at the Writers Guild of America Theater in Beverly Hills, as part of DocuDays LA, and Saturday, March 6, at 1:30 p.m. at the Paley Center for Media in New York City as part of DocuDays NY. For more information on DocuDays LA, click here. For more information on DocuDays NY, click here.